Over at the Conflict Antiquities site, a blog ran by Dr Samuel Hardy who is a researcher at UCL, there are a series of entries on the subject of ‘Free Archaeology‘ which help to highlight the current plight of the archaeological and heritage sector in the UK and beyond. The series is a great introduction for current cultural, political and employment issues and trends in the sector, whilst also highlighting the dire effects that austerity is having on the archaeological and heritage trades in the UK and further afield. 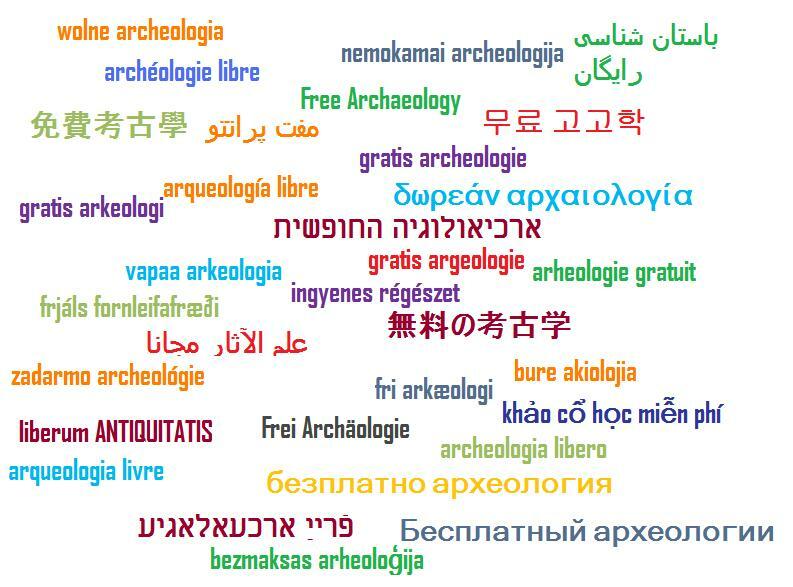 Free archaeology across the globe in languages (Source: myself, TBOM). A point many volunteers on archaeological excavations in the UK will recognise- am I paying just to provide labour for the company? (It is reminiscent of the ‘pay to play’ policy that some music venues used to employ for upcoming bands to perform). Am I being trained in the best archaeological technique or am I just providing a helping hand? It is rare that volunteering is free on UK excavations, and in some popular and well regarded excavations it can cost hundreds of pounds a week just to partake, let alone factoring in the the accommodation or living costs for the duration of the participation. It is important to recognise that your manager is also a person undergoing the same stress of every day living as well. Archaeology, as a sector, has been hit hard by the recession and lack of building projects in the past few years. Smaller units are continually feeling the pinch and costs of projects each and every week, whilst larger ‘safer’ units are themselves having to downsize and cut costs. From the post: “They completely exclude other real-terms or effective cuts to the cultural heritage sector, such as frozen funding and frozenpositions (and consequently stretched staff); sometimes drastically reduced opening hours (and consequently reduced wages or lost jobs, or staff consequently reduced to precarious, seasonal workers). They also completely exclude allegedly temporary, years-long closure or mothballing of sites and projects; definite but unspecified redundancies and funding cuts with proposed job losses and other as-yet-unstated consequences; and other threats of redundancy and precarisation, for instance through the outsourcing of (decades-long) museum contracts. I have wrote before on this blog regarding Birmingham University’s decision to shut down it’s Archaeology and Antiquity department, and the impact that this has had on other university departments who are eagerly watching as to how this impacts the development of other archaeology departments across the university sector. What we are seeing with the effects of austerity is the loss of highly capable individuals across council units, academic departments and commercial units. The issue of funding PhD’s has also come to the fore as a price hikes in undergraduate degrees for students at UK universities also impacts Post-graduate study intake numbers. It is my belief that changes to the intake numbers of archaeological departments will result in some form of academic change regarding archaeology departments, I will follow this up if it takes place with another entry. There are further posts in the series but I shall leave you to discover them. You may not agree with every point that Dr Hardy makes, but they do help to highlight the changing face of the archaeology and heritage sectors over the past few years. It is something I would heavily advise students or individual’s who are considering working in these sectors to consider and to research. As an archaeologist without a job in the sector, and as a volunteer for numerous years with numerous units, it is fantastic to see a series of posts discussing the current employment, political and cultural situation within the archaeological and heritage sector. And it is rather refreshingly frank! * Who I hope will forgive me for advertising the excellent posts. ** Full disclosure, I attended the 2011 Magdeburg placement and gained invaluable new skills, friends and experience.